So today, Wednesday, is the first day of school. Yesterday was the fake first day of school- like it was just a drop in. But today I see my Pia going into 2nd grade and my little muffin Coco going to Kindergarten for the first time and I cry myself into a big soggy puffy puddle because I can’t believe how big my babies are getting. Sniff sniff…. So while one part of me is so sad because I just want to especially keep Coco 5 and in PK forever, the other part of me just really needs my kids to stop bickering and nagging me and go back to school. Like as soon as possible. I am a little fascinated with how quiet the house will be. Coco has been in school for years, but never 5 days a week- just three. I am actually kind of freaking out. Will I get so much more done during the day than I used to? I feel like just knowing that you pretty much can’t be interrupted during the day is insane!! Because while I LOVE working from home, there are a lot of interruptions. And most of them start with “mom?” We will see…. So on to this salad which I recently made. Even though my kids feel like they are going through a slightly picky phase, Pia actually really loved this. Well, mostly she just ate the pieces of crispy cauliflower out of the salad and left everything else, but I still call that a win. And as for me- I like all the other stuff. 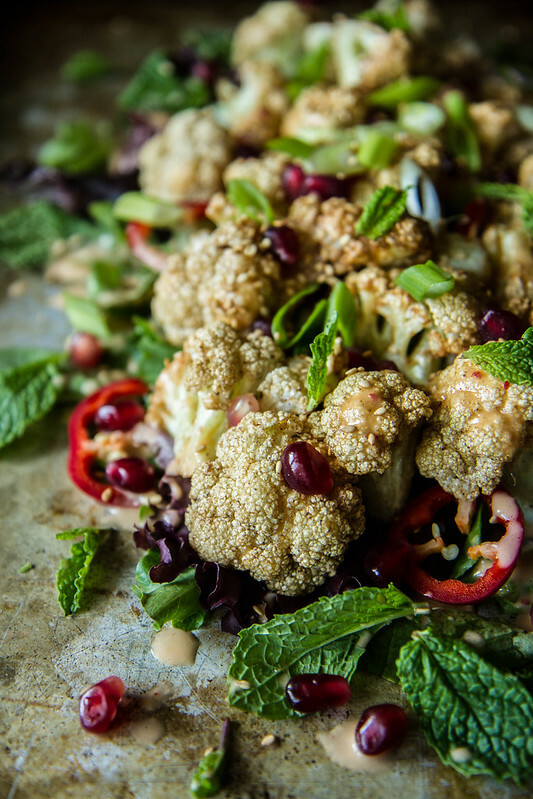 The add ins of mint and sweet pomegranate and spicy chili were amazing compliments to the nutty fried cauliflower. This salad is a great meatless main dish or an excellent side dish to something like a hearty beef or pork dish. Either way, its delicious! Enjoy. For the Vinaigrette: in the jar of a blender combine all of the ingredients and puree on high until smooth. Season to taste with kosher salt. Set aside. On a serving platter, arrange the mixed greens and fresh mint leaves. In a pot or deep sauce pan bring a few inches of oil to 375 degrees. Add a few handfuls of the cauliflower at a time and increase the heat to high. You want to keep the heat above 350 degrees, so don’t over crowd the oil with cauliflower. Cook the cauliflower about 1 minute, stirring a few times, until golden brown and floating on top. Pull the cauliflower out with a slotted spoon and set to drain on paper towels. Sprinkle with kosher salt. Continue with the rest of the cauliflower. Place the cauliflower on the mixed greens and mint and drizzle with the vinaigrette. Sprinkle with the green onion, chili and pomegranate seeds and then the sesame seeds- serve immediately. This sounds so, so good. I love that crispy cauliflower AND that sauce!! Yum! I can not handle this deliciousness!!! Thank you so much Rebecca!! Aww the kiddos off to school again! This looks like a pan of deliciousness! Oh I know exactly how those interruptions go, “Mom . . .” Now I have a a shrieking baby. But it’s still hard to see them grow up. The upside as you mentioned – think of all the work you can get done before they get home! 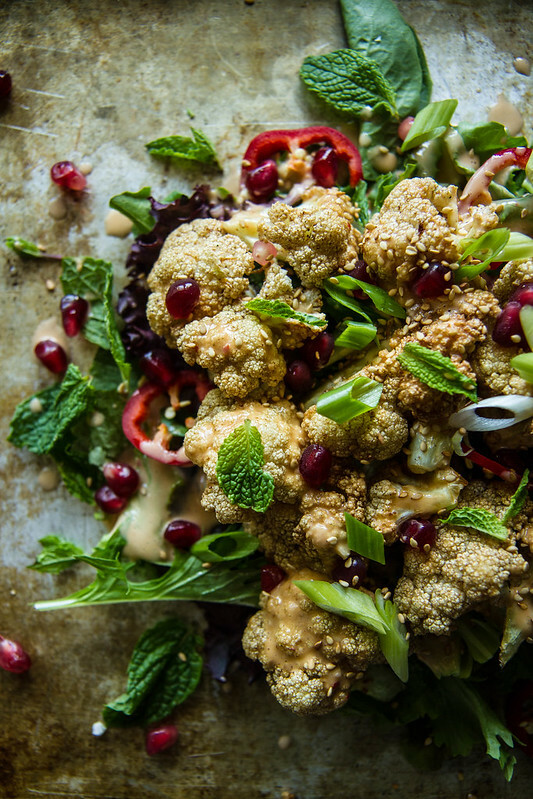 This crispy cauliflower salad looks amazing! Naomi- one time Pete counted how many time stye girls said mom in one day and it was like 95 times. We have an epidemic on our hands! Aww it’s so bittersweet when the last munchkin goes off to kindergarten. I loved having the house to myself but cried my eyes out the first day. I don’t cry anymore – remember the Staples commercial where the mom is dancing through Staples with her cart and seems to be overjoyed that the kiddos are going back to school? That’s me. But when they get home I am super happy to see them and devote my evening to their homework, snacks, dinner and sports! Amazed that you get your little one to eat cauliflower! Thank you for sharing Karen- I didn’t cry or anything, but I kind of thought about it! And you are right- I was so happy to see them at the end of the day because I had some peace and quiet for once. And I have no idea why Pia will eat cauliflower. It’s so weird. 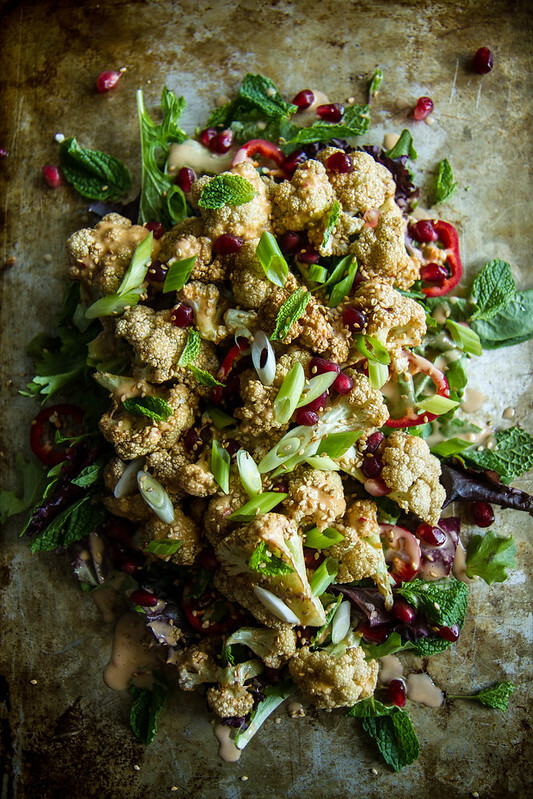 I love crispy cauliflower and that tahini vinaigrette sounds fab! Thanks you Laura- I think you will love this combo then! Beautiful salad…love all that mint! And I’m so happy I can find pomegranates this time of year!